Many people are drawn by Victorian post mortem photography, myself included. I can’t quite put my finger on why it tends to draw me in. Perhaps it’s the eerie, spooky, ghostly feel about it. I am not alone by any means. Some of the photos cause me to feel sympathy for those depicted in these photographs. The ones that I find particularly heartbreaking are those that depict mothers with their dead children. One can only imagine how difficult that must have been. Being a mother myself, my heart goes out to them, even though all have since gone on to a greater glory. So why were so many of these photos taken? The mortality rate among infants and children was quite high during the period most of these photos were taken. For many children of this time even a common illness could be fatal. With the invention of the daguerreotype in 1939, taking portraits became much more common place in society. Portraits before this invention had to be painted by an artist and were quite expensive. After the invention of photography it became easier for every day people to afford to get photos taken. This became a method for people to memorialize their loved ones. These photos would become keepsakes for the grieving families. The post mortem photo would often be the only picture the family would have of a child, for instance. Victorian post mortem photography hit its apex by the end of the nineteenth century, when different types of cameras started coming on the market. This allowed people to take their own snapshots. How did the styles change with post mortem photography? Early types of Victorian post mortem photography usually depicted full body shots or closeups of the deceased face. The early shots rarely had a coffin in them. The subject would often be shown as lifelike. This sometimes involved painting eyes on closed eyelids. Sometimes the body would be place in a sitting position with other family members, or on a stand, so they would appear alive and standing with the rest of the family. Children would often be shown on the sofa or in a bed or crib. Some may be holding a doll or other favorite toy. Some were pictured with their siblings. Others would be held by their mother or both parents. I have always been extremely fascinated with them myself, Tarra. The babies with their parents are heartbreaking, however. This subject has always fascinated me. Thank you for providing this wonderful information on Victorian postmortem pictures. Thank you, Hilary. I will probably be expanding on certain aspects of this in a future article. So stay tuned! Thank you for the great videos you provided in this article about Victorian death photography. I enjoyed all of them very much. I love this stuff myself, Dalton, and it was a joy to research! 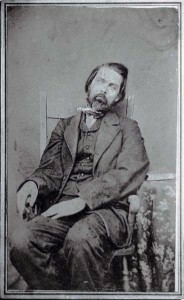 I just can’t get enough of these postmortem photos. I have been thinking about trying to start a collection. It is probably very difficult to get a hold of the original photos. I agree. They are probably extremely difficult to come by. Especially since interest is up. You have provided some of the best information I have seen about Victorian postmortem photography in one place. Having all these tasteful videos in one place is appreciated! I tried to find the ones that were in the best taste on purpose. Even though these people have gone on to a greater reward a long, long time ago, they still deserve to be treated with respect. This type of photography has got to be some of the creepiest. Can you imagine having to pose your child in death? Shivers! Carlee, I can’t even imagine what those poor parents went through. This was often the only photo they had of their child. Did’t wait so much time looking for great info on this Victorian postmortem stuff. Great videos too! Thank you, Lydia! Stop back later in the season to see what I come up with next. This is one of my favorite subjects, I will be drilling down in greater detail. You just don’t know how much I really appreciate you posting all the cool videos on this subject. I don’t know what draws me to old postmortem pictures, but i really dig this stuff. Thank you, thank you, THANK YOU! L.M. I’m drawn to this stuff like a magnet too, Lanora. I believe a lot of people are. I can’t put a finger on the reason either. I just know I like it!